The only witch from the Orussian Empire in the 501st Wing, at thirteen years old. Preferring to stay indoors during the day, Sanya has been described as "nocturnal." At times she is literally asleep on her feet, counting on Eila to move her around. Despite this somewhat limiting her contact with the other members of the 501st, her low profile makes her ideal for night missions and sneak attacks. Gains the ears and tail of a black cat with her Striker Unit equipped. 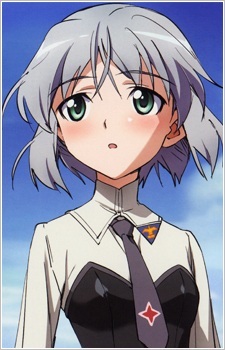 Sanya's rank is Flying Officer and her original unit affiliation is the Orussia Imperial Army 586th Fighter Regiment. Her weapon of choice is a modified Fliegerfaust called the "Fliegerhummer." Her Striker Unit design is based on the MiG60 (a fictional warbird combining features of the MiG-1, MiG-3, and Yakovlev Yak-1) and her pilot archetype is Lydia Litvyak.